Parliament Hill in Ottawa at Ottawa River. The Hill is dominated by the Gothic Revival style Parliament of Canada Buildings. The Centre Block behind the Peace Tower houses the Senate and Commons chambers. The Parliament complex was built between 1859 to 1865. Satellite view is showing Ottawa, the country's fourth largest city and the national capital of Canada. The city is located in the south east of the country in the province of Ontario, close to the U.S. border on the south bank of the Ottawa River, a tributary of the St. Lawrence River. 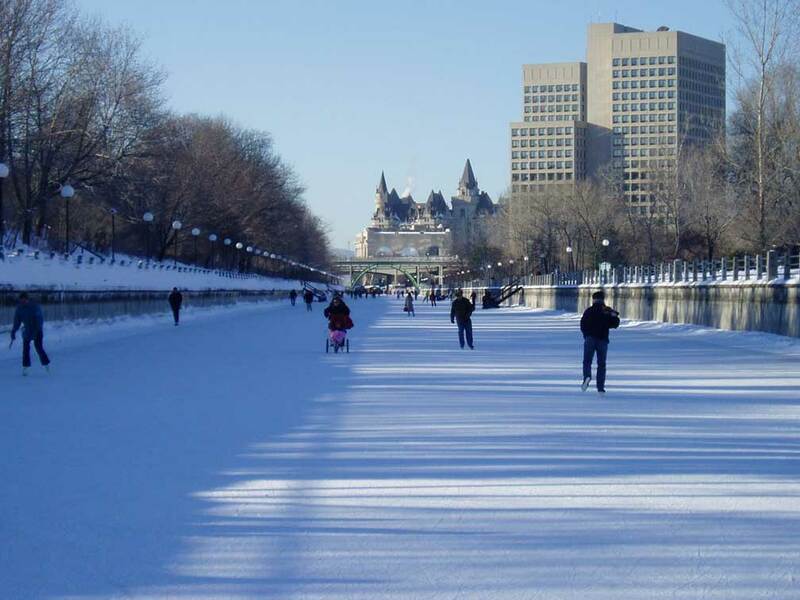 Rideau Canal in downtown Ottawa, some say in winter the canal becomes the longest skating rink in the world. The construction of the canal, built in 1832, was a military project to provide a secure route between Montreal and the city of Kingston on Lake Ontario in times when Great Britain and the United States rivaled for the control of the region. Today the Rideau Canal is a UNESCO World Heritage Site. The city was founded in 1826 and named Bytown after Colonel John By who was responsible for the entire Rideau Canal construction project. When in 1832 the Rideau Canal was completed Bytown had a population of about 1,000 people. 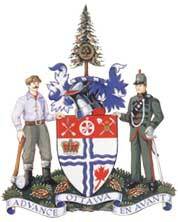 In 1855 Bytown was incorporated as a city and renamed Ottawa. By 'Queen's choice', Ottawa became the capital of Canada on New Year's Eve of 1857. Today the city has a population of about 880,000 inhabitants, more than 1.2 million people live in the Ottawa-Gatineau metropolitan area (Census 2011). Spoken languages are English (predominant) and French. Ottawas climate can offer extremely hot and humid summers and extremely cold winters. In Mercers Top 50 cities: Eco-City ranking 2010, Ottawa ranks #3 after Calgary, Alberta, Canada and the city of Honolulu, Hawaii. The city is home to Ottawa University and the Carleton University. Shaw Centre, Ottawa's convention center. Just zoom in (+) to see Parliament Hill, with the Parliament Buildings, seat of the Parliament of Canada. The Map shows a city map of Ottawa with expressways, main roads and streets, Ottawa Macdonald-Cartier International Airport (IATA Code: YOW) to the south. To find a location like Ottawa City Hall or Ottawa Hospital General Campus use the form below. To see just the map click on the "Map" Button. Google Earth: Searchable Map and Satellite View of the City of Ottawa, Canada. Wikipedia article about the city of Ottawa. Atlanta, Atlantic City, Austin, Baltimore, Boston, Charlotte, Chicago, Cincinnati, Cleveland, Columbus, Dallas, Denver, Detroit, El Paso, Fort Worth, Honolulu, Houston, Indianapolis, Jacksonville, Kansas City, Las Vegas, Long Beach, Los Angeles, Memphis, Miami, Milwaukee, Minneapolis, Nashville, New Orleans, New York City, Norfolk, Oklahoma City, Orlando, Philadelphia, Phoenix, Pittsburgh, Portland, Sacramento, St. Louis, San Antonio, San Diego, San Francisco, San Jose, Santa Fe, Seattle, Tampa, Tucson, Washington D.C.